A new time-integrated thermal desorption technique has been developed that can be used with selected ion flow tube mass spectrometry, TI-TD/SIFT-MS, for off-line quantitative analyses of VOCs accumulated onto sorbents. Using a slow desorption temperature ramp, the absolute amounts of desorbed compounds can be quantified in real time by SIFT-MS and constitutional isomers can be separated. 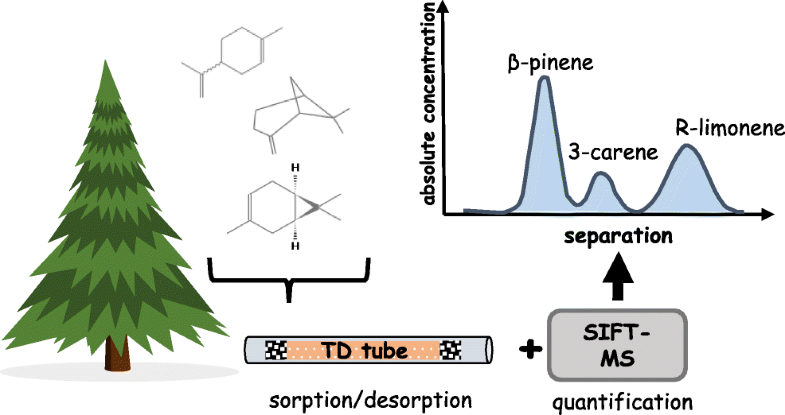 To facilitate application of this technique to environmental atmospheric monitoring, method parameters were optimised for quantification of the three common atmospheric monoterpenes: β-pinene, R-limonene and 3-carene. Three sorbent types, Tenax TA, Tenax GR and Porapak Q, were tested under 26 different desorption conditions determined by the “design of experiment”, DOE, systematic approach. 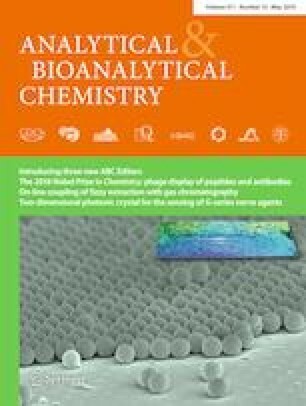 The optimal combination of type of sorbent, bed length, sampling flow rate, sample volume and the initial desorption temperature was determined from the experimental results by ANOVA. It was found that Porapak Q exhibited better efficiency of sample collection and further extraction for total monoterpene concentration measurements. On the other hand, Tenax GR or TA enabled separation of all three monoterpenes. The results of this laboratory study were tested with the sample accumulated from a branch of a Pinus nigra tree. The online version of this article ( https://doi.org/10.1007/s00216-019-01782-6) contains supplementary material, which is available to authorized users. We would like to thank David Smith for useful discussions and help with this work. This study was financially supported by the Grant Agency of the Czech Republic (project No. 17-13157Y from which the salaries of KS, AS, PP and VS were covered together with all material costs). MB received support from Charles University (project Specific University Research, SVV).